Established in 1996 the Belfast Counselling Group is a self-referral service offering Cognitive Behaviour Therapy (CBT), Psychodynamic, Solution Focused Therapy and Eye Movement Desensitisation Therapy (EMDR) for individuals. 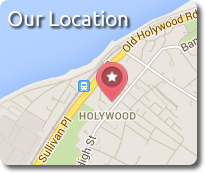 We operate in Holywood offering one-to-one therapy in a confidential and discreet caring environment in high quality premises with disabled access, toilets, rail and bus links on the doorstep and with plenty of parking nearby. Belfast Counselling Group has been in existence for 23 years offering Cognitive Behaviour therapy for patients with, anxiety, depression, trauma, Post Traumatic Stress Disorder, (PTSD), panic attacks, phobias, OCD, low self confidence and self esteem, stress pain management and work-related problems such as bullying and harassment, managing workload, manager/supervisor relationships and adjusting to new responsibilities. We also specialize in working with patients traumatized by the troubles or who have suffered physical and Psychological trauma and present with trauma symptoms of high arousal flashbacks and nightmares. In addition to one-to- one counselling using Cognitive Behavioural Therapy, EMDR and solution focused therapy we offer medical-legal report services and individual anger management and assertion skills training. We are registered with all leading health insurers including BUPA, AXA-PPP, Cigna, Aviva, WPA and H3 a local health insurer and part of the 3Five2 Group.